Synopsis: As a math savant uncooks the books for a new client, the Treasury Department closes in on his activities and the body count starts to rise. Review: Here are a few professions I wouldn’t have a hard time believing Ben Affleck to have onscreen: firefighter, steel worker, bartender, caped crusader, kingpin, suburban dad, cowpoke. One profession I couldn’t see? Accountant. Look, Affleck has matured into a solid actor (Gone Girl) and talented director (Argo) during his time in Hollywood. 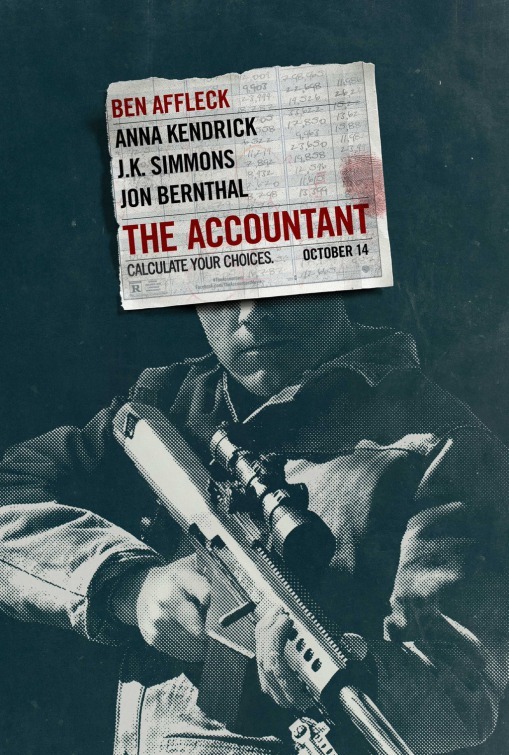 There’s little he could lend his name to that I wouldn’t willingly sit through and for the most part, The Accountant is a solid thriller that’s predictable but nonetheless entertaining. Yet try as he might and squint as I may, I never fully bought Affleck playing an on the spectrum number cruncher by day and gunslinger by night. I’m getting ahead of myself, though. I’m naturally squirmy when I go to the movies. I’m a habitual watch checker, sometimes in desperation to see how much longer I have to spend in movie prison with drek like Mother’s Day or to attempt to halt the clock hoping to have more quality time with the movies I do enjoy. I almost feel my ratings should be in watch checks and if I did, The Accountant would have scored high. It took me 105 minutes to get the itch to check and that’s in large part due to the film’s entertainment value as a throwback vehicle for its star. Affleck plays Christian Wolff, an autistic savant posing as a small-time CPA that’s great with numbers but not so great with people. He’s so good at his job in fact that all sorts of unsavory clients come his way, most of them in need of finding the leak in their amassed fortunes. This talent brings him to the more legit high-tech robotics company owned by brother (John Lithgow, Interstellar) and sister (Jean Smart, Hope Springs) needing to uncover the mole that’s been skimming millions off of their bottom line. Working with a curious but overly talkative whistle-blowing employee (Anna Kendrick, Cake), they aren’t even 24 hours into the investigation when someone winds up dead and their services (in the office and on earth) are no longer needed and are targeted by a mysterious hitman (Jon Bernthal, Sicario). While all this is going on, a Treasury Department agent (J.K. Simmons, Zootopia) blackmails a young analyst (Cynthia Addai-Robinson, Star Trek Into Darkness) into finding out who this rogue accountant is so Wolff winds up having two factions after him. The Accountant is structured in a way I happen to love. Random threads in the beginning half start to slowly tie together as Bill Dubuque’s (The Judge) screenplay introduces a multitude of twists and turnbacks all the way until the final frame. There’s one big reveal that seemed to come as a shock to some audience members that was clear as day to me an hour earlier. This isn’t an attempt to toot my own clue following horn but it’s not as landmark of a bombshell as the movie wants it to be. There are a few strands that don’t get a proper tie off or even a deeper explanation after they’ve been introduced, but Dubuque keeps his head in the game most of the time. Stuck behind a pair of glasses with a square haircut and stiff suits, Affleck commits to the piece and does what he can in a part he ultimately just isn’t right for. It’s not a knock against him in the least, sometimes the spark just isn’t there. Kendrick has played this type of chatty pixie before and, aside from holding her own in a claustrophobic fight scene, she seems to be coasting. Same goes for Simmons who has a monologue right before the final reel that slows the film to a jarring halt…that’s when the watch got a peek, by the way. For me, Addai-Robinson was the real find for me, though her promising arc feels forgotten before the movie was half over. Director Gavin O’Connor fills the rest of the cast with interesting character actors like Smart and Jeffrey Tambor (The Hangover Part III) that I wouldn’t have minded seeing more of. While I was energized by the fact the movie was born from an original script and not an established property or novel, The Accountant finds some trouble when it comes time to sum itself up, falling prey to curse of one too many endings. You’ll be half out of your seat in anticipation of the credits rolling until O’Connor adds in another unnecessary establishing shot of something we already understand. All nitpicks aside, for the fall movie-going season The Accountant represents entertainment at its most cozy and I engaged with it more than I thought I would. It’s not going to rock your world but it’s a nice way to spend a few hours of your time. It’s not even tax season yet, but take some time to audit The Accountant.